Early in his political career, Debs was a member of the Democratic Party. He was elected as a Democrat to the Indiana General Assembly in 1884. After working with several smaller unions, including the Brotherhood of Locomotive Firemen, Debs was instrumental in the founding of the American Railway Union (ARU), one of the nation's first industrial unions. After workers at the Pullman Palace Car Company organized a wildcat strike over pay cuts in the summer of 1894, Debs signed many into the ARU. He called a boycott of the ARU against handling trains with Pullman cars in what became the nationwide Pullman Strike, affecting most lines west of Detroit and more than 250,000 workers in 27 states. Purportedly to keep the mail running, President Grover Cleveland used the United States Army to break the strike. As a leader of the ARU, Debs was convicted of federal charges for defying a court injunction against the strike and served six months in prison. Debs was born on November 5, 1855 in Terre Haute, Indiana to Jean Daniel and Marguerite Mari Bettrich Debs, who immigrated to the United States from Colmar, Alsace, France. His father, who came from a prosperous family, owned a textile mill and meat market. Debs was named after the French authors Eugène Sue and Victor Hugo. Debs attended public school, dropping out of high school at age 14. He took a job with the Vandalia Railroad cleaning grease from the trucks of freight engines for fifty cents a day. He later became a painter and car cleaner in the railroad shops. In December 1871, when a drunken locomotive fireman failed to report for work, Debs was pressed into service as a night fireman. He decided to remain a fireman on the run between Terre Haute and Indianapolis, earning more than a dollar a night for the next three and half years. In July 1875, Debs left to work at a wholesale grocery house, where he remained for four years while attending a local business school at night. Debs had joined the Brotherhood of Locomotive Firemen (BLF) in February 1875 and became active in the organization. In 1877 he served as a delegate of the Terre Haute lodge to the organization's national convention. Debs was elected associate editor of the BLF's monthly organ, Firemen's Magazine, in 1878. Two years later, he was appointed Grand Secretary and Treasurer of the BLF and editor of the magazine in July 1880. He worked as a BLF functionary until January 1893 and as the magazine's editor until September 1894. At the same time, he became a prominent figure in the community. He served two terms as Terre Haute's city clerk from September 1879 to September 1883. In the fall of 1884, he was elected to the Indiana General Assembly as a Democrat, serving for one term. Debs married Kate Metzel on June 9, 1885. Their home still stands in Terre Haute, preserved amidst the campus of Indiana State University. The railroad brotherhoods were comparatively conservative organizations, focused on providing fellowship and services rather than on collective bargaining. Their motto was "Benevolence, Sobriety, and Industry". As editor of the official journal of the Brotherhood of Locomotive Firemen, Debs initially concentrated on improving the Brotherhood's death and disability insurance programs. During the early 1880s, Debs' writing stressed themes of self-upliftment: temperance, hard work and honesty. Debs also held the view that "labor and capital are friends" and opposed strikes as a means of settling differences. The Brotherhood had never authorized a strike from its founding in 1873 to 1887, a record which Debs was proud of. Railroad companies cultivated the Brotherhood and granted them perks like free transportation to their conventions for the delegates. Debs also invited railroad president Henry C. Lord to write for the magazine. Summarizing Debs's thought in this period, historian David A. Shannon wrote: "Debs's desideratum was one of peace and co-operation between labor and capital, but he expected management to treat labor with respect, honor and social equality". Debs gradually became convinced of the need for a more unified and confrontational approach as railroads were powerful companies in the economy. One influence was his involvement in the Burlington Railroad Strike of 1888, a defeat for labor that convinced Debs of the necessity of organizing along craft lines. After stepping down as Brotherhood Grand Secretary in 1893, Debs organized one of the first industrial unions in the United States, the American Railway Union (ARU), for unskilled workers. He was elected president of the ARU upon its founding, with fellow railway labor organizer George W. Howard as first vice president. The Union successfully struck the Great Northern Railway in April 1894, winning most of its demands. In 1894, Debs became involved in the Pullman Strike, which grew out of a compensation dispute started by the workers who constructed the train cars made by the Pullman Palace Car Company. The Pullman Company, citing falling revenue after the economic Panic of 1893, had cut the wages of its employees by 28%. The workers, many of whom were already members of the ARU, appealed for support to the union at its convention in Chicago, Illinois. Debs tried to persuade the Union members who worked on the railways that the boycott was too risky, given the hostility of both the railways and the federal government, the weakness of the union, and the possibility that other unions would break the strike. The membership ignored his warnings and refused to handle Pullman cars or any other railroad cars attached to them, including cars containing U.S. Mail. After ARU Board Director Martin J. Elliott extended the strike to St. Louis, doubling its size to 80,000 workers, Debs relented and decided to take part in the strike, which was now endorsed by almost all members of the ARU in the immediate area of Chicago. On July 9, 1894, a New York Times editorial called Debs "a lawbreaker at large, an enemy of the human race". Strikers fought by establishing boycotts of Pullman train cars and with Debs' eventual leadership the strike came to be known as "Debs' Rebellion". 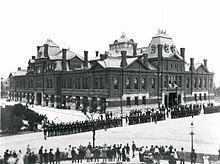 The federal government intervened, obtaining an injunction against the strike on the theory that the strikers had obstructed the US Mail, carried on Pullman cars, by refusing to show up for work. President Grover Cleveland, whom Debs had supported in all three of his presidential campaigns, sent the United States Army to enforce the injunction. The entrance of the Army was enough to break the strike. Overall, 30 strikers were killed in the strike, 13 of them in Chicago, and thousands were blacklisted. :154 An estimated $80 million worth of property was damaged and Debs was found guilty of contempt of court for violating the injunction and sent to federal prison. Debs was represented by Clarence Darrow, later a leading American lawyer and civil libertarian, who had previously been a corporate lawyer for the railroad company. While it is commonly thought that Darrow "switched sides" to represent Debs, a myth repeated by Irving Stone's biography, Clarence Darrow For the Defense, he had in fact resigned from the railroad earlier, after the death of his mentor William Goudy. A Supreme Court case decision, In re Debs, later upheld the right of the federal government to issue the injunction. I began to read and think and dissect the anatomy of the system in which workingmen, however organized, could be shattered and battered and splintered at a single stroke. The writings of Bellamy and Blatchford early appealed to me. The Cooperative Commonwealth of Gronlund also impressed me, but the writings of Kautsky were so clear and conclusive that I readily grasped, not merely his argument, but also caught the spirit of his socialist utterance – and I thank him and all who helped me out of darkness into light. Additionally, Debs was visited in jail by Milwaukee socialist newspaper editor Victor L. Berger, who in Debs' words "came to Woodstock, as if a providential instrument, and delivered the first impassioned message of Socialism I had ever heard". In his 1926 obituary in Time, it was said that Berger left him a copy of Das Kapital and "prisoner Debs read it slowly, eagerly, ravenously". Debs emerged from jail at the end of his sentence a changed man. He would spend the final three decades of his life proselytizing for the socialist cause. After Debs and Martin Elliott were released from prison in 1895, Debs started his socialist political career. Debs persuaded ARU membership to join with the Brotherhood of the Cooperative Commonwealth to found the Social Democracy of America. Debs' wife Kate was opposed to socialism. The "tempestuous relationship with a wife who rejects the very values he holds most dear" was the basis of Irving Stone's biographical novel Adversary in the House. 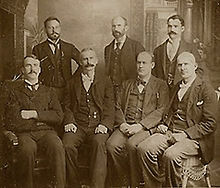 The Social Democracy of America (SDA), founded in 1897 by Eugene V. Debs from the remnants of his American Railway Union, was deeply divided between those who favored a tactic of launching a series of colonies to build socialism by practical example and others who favored establishment of a European-style socialist political party with a view to capture of the government apparatus through the ballot box. The June 1898 convention would be the group's last, with the minority political action wing quitting the organization to establish a new organization, the Social Democratic Party of America (SDP), also called the Social Democratic Party of the United States. Debs was elected chairman of the Executive Board of the National Council, the board which governed the party. 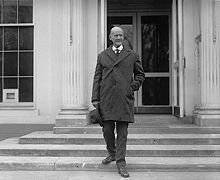 Though the party did not have a sole figure that governed its actions, Debs' position as chairman and his notoriety gave him the status of party figurehead. Along with Elliott, Debs was the first federal office candidates for the fledgling socialist party, running unsuccessfully for president and Congress in 1900. Along with his running mate Job Harriman, Debs received 87,945 votes (0.6% of the popular vote) and no electoral votes. Both the Social Democratic Party and dissidents who split from the Socialist Labor Party back in 1899 would unify forces at a Socialist Unity Convention held in Indianapolis in the summer of 1901 — a meeting which established the Socialist Party of America (SPA). 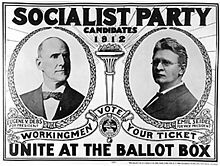 Debs was the Socialist Party of America candidate for President in 1904, 1908, 1912 and 1920 (the final time from prison). In his showing in the 1904 election, Debs received 402,810 votes, which was 3.0% of the popular vote. Debs received no electoral votes and with vice presidential candidate Ben Hanford ultimately finished third overall. In the 1908 election, Debs again ran on the same ticket as Hanford. While receiving a slightly higher number of votes in the popular vote (420,852), he received 2.8% of the popular vote and no electoral votes. Debs received 6.0% of the popular vote (a total of 901,551 votes) in 1912. In the election in Florida, he finished second behind Wilson and ahead of President William Howard Taft and former President Teddy Roosevelt. Running alongside Emil Seidel, Debs again received no electoral votes. His total of 913,693 votes in the 1920 campaign, when women finally had the federal right to vote, remains the all-time high for a Socialist Party candidate. Although he received some success as a third-party candidate, Debs was largely dismissive of the electoral process as he distrusted the political bargains that Victor Berger and other "Sewer Socialists" had made in winning local offices. He put much more value on organizing workers into unions, favoring unions that brought together all workers in a given industry over those organized by the craft skills workers practiced. 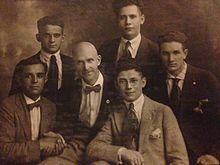 After his work with the Brotherhood of Locomotive Firemen and the American Railway Union, Debs' next major work in organizing a labor union came during the founding of the Industrial Workers of the World (IWW). On June 27, 1905 in Chicago, Illinois, Debs and other influential union leaders including Bill Haywood, leader of the Western Federation of Miners; and Daniel De Leon, leader of the Socialist Labor Party, held what Haywood called the "Continental Congress of the working class". Haywood stated: "We are here to confederate the workers of this country into a working class movement that shall have for its purpose the emancipation of the working class". Debs stated: "We are here to perform a task so great that it appeals to our best thought, our united energies, and will enlist our most loyal support; a task in the presence of which weak men might falter and despair, but from which it is impossible to shrink without betraying the working class". Although the IWW was built on the basis of uniting workers of industry, a rift began between the union and the Socialist Party. It started when the electoral wing of the Socialist Party, led by Victor Berger and Morris Hillquit, became irritated with speeches by Haywood. In December 1911, Haywood told a Lower East Side audience at New York's Cooper Union that parliamentary Socialists were "step-at-a-time people whose every step is just a little shorter than the preceding step". It was better, Haywood said, to "elect the superintendent of some branch of industry, than to elect some congressman to the United States Congress". In response, Hillquit attacked the IWW as "purely anarchistic". The Cooper Union speech was the beginning of a split between Haywood and the Socialist Party, leading to the split between the factions of the IWW, one faction loyal to the Socialist Party and the other to Haywood. 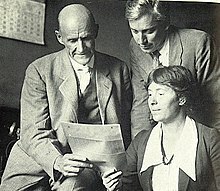 The rift presented a problem for Debs, who was influential in both the IWW and the Socialist Party. The final straw between Haywood and the Socialist Party came during the Lawrence Textile Strike, when disgusted with the decision of the elected officials in Lawrence, Massachusetts to send police, who subsequently used their clubs on children, Haywood publicly declared that "I will not vote again" until such a circumstance was rectified. Haywood was purged from the National Executive Committee by passage of an amendment that focused on the direct action and sabotage tactics advocated by the IWW. Debs was probably the only person who could have saved Haywood's seat. In 1906, when Haywood had been on trial for his life in Idaho, Debs had described him as "the Lincoln of Labor" and called for Haywood to run against Theodore Roosevelt for President, but times had changed and Debs, facing a split in the party, chose to echo Hillquit's words, accusing the IWW of representing anarchy. Debs thereafter stated that he had opposed the amendment, but that once it was adopted it should be obeyed. Debs remained friendly to Haywood and the IWW after the expulsion despite their perceived differences over IWW tactics. Prior to Haywood's dismissal, the Socialist Party membership had reached an all-time high of 135,000. One year later, four months after Haywood was recalled, the membership dropped to 80,000. The reformists in the Socialist Party attributed the decline to the departure of the "Haywood element" and predicted that the party would recover, but it did not. In the election of 1912, many of the Socialists who had been elected to public office lost their seats. Debs was noted by many to be a charismatic speaker who sometimes called on the vocabulary of Christianity and much of the oratorical style of evangelism, even though he was generally disdainful of organized religion. It has been said that Debs was what every socialist and radical should be, i.e. fierce in his convictions, but kind and compassionate in his personal relations. As Heywood Broun noted in his eulogy for Debs, quoting a fellow Socialist: "That old man with the burning eyes actually believes that there can be such a thing as the brotherhood of man. And that's not the funniest part of it. As long as he's around I believe it myself". Debs' speeches against the Wilson administration and the war earned the enmity of President Woodrow Wilson, who later called Debs a "traitor to his country". On June 16, 1918, Debs made a speech in Canton, Ohio urging resistance to the military draft of World War I. He was arrested on June 30 and charged with ten counts of sedition. Debs appealed his conviction to the Supreme Court. In its ruling on Debs v. United States, the court examined several statements Debs had made regarding World War I and socialism. While Debs had carefully worded his speeches in an attempt to comply with the Espionage Act, the Court found he had the intention and effect of obstructing the draft and military recruitment. Among other things, the Court cited Debs' praise for those imprisoned for obstructing the draft. Justice Oliver Wendell Holmes, Jr. stated in his opinion that little attention was needed since Debs' case was essentially the same as that of Schenck v. United States, in which the Court had upheld a similar conviction. Debs went to prison on April 13, 1919. In protest of his jailing, Charles Ruthenberg led a parade of unionists, socialists, anarchists and communists to march on May 1 (May Day) in Cleveland, Ohio. The event quickly broke into the violent May Day riots of 1919. Debs ran for president in the 1920 election while in prison in Atlanta, Georgia, at the Atlanta Federal Penitentiary. He received 919,799 votes (3.4%), slightly less than he had won in 1912, when he received 6%, the highest number of votes for a Socialist Party presidential candidate in the United States. During his time in prison, Debs wrote a series of columns deeply critical of the prison system. They appeared in sanitized form in the Bell Syndicate and were published in his only book, Walls and Bars, with several added chapters. It was published posthumously. While the flower of American youth was pouring out its blood to vindicate the cause of civilization, this man, Debs, stood behind the lines sniping, attacking, and denouncing them....This man was a traitor to his country and he will never be pardoned during my administration. There is no question of his guilt....He was by no means as rabid and outspoken in his expressions as many others, and but for his prominence and the resulting far-reaching effect of his words, very probably might not have received the sentence he did. He is an old man, not strong physically. He is a man of much personal charm and impressive personality, which qualifications make him a dangerous man calculated to mislead the unthinking and affording excuse for those with criminal intent. When Debs was released from the Atlanta Penitentiary, the other prisoners sent him off with "a roar of cheers" and a crowd of 50,000 greeted his return to Terre Haute to the accompaniment of band music. En route home, Debs was warmly received at the White House by Harding, who greeted him by saying: "Well, I've heard so damned much about you, Mr. Debs, that I am now glad to meet you personally". In 1924, Debs was nominated for the Nobel Peace Prize by the Finnish Socialist Karl H. Wiik on the grounds that "Debs started to work actively for peace during World War I, mainly because he considered the war to be in the interest of capitalism". He spent his remaining years trying to recover his health, which was severely undermined by prison confinement. In late 1926, he was admitted to Lindlahr Sanitarium in Elmhurst, Illinois. He died there of heart failure on October 20, 1926, at the age of 70. His body was cremated and buried in Highland Lawn Cemetery in Terre Haute, Indiana. Debs helped motivate the American Left to organise political opposition to corporations and World War I. American socialists, communists, and anarchists honor his work for the labor movement and motivation to have the average working man build socialism without large state involvement. Several books have been written about his life as an inspirational American socialist. In 1979, Bernie Sanders produced a documentary about Debs which was released as a film and an audio LP record as an audio-visual teaching aid. In the documentary, he described Debs as "probably the most effective and popular leader that the American working class has ever had". Sanders hung a portrait of Debs in City Hall in Burlington, Vermont when he served as mayor of the city in the 1980s and has a plaque dedicated to Debs in his Congressional office. It has been argued that Debs was important in first advocating for reforms which were subsequently implemented by more moderate left-leaning politicians, such as banking reform and child labor laws. On May 22, 1962, Debs' home was purchased by the Eugene V. Debs Foundation for $9,500, which worked to preserve it as a Debs memorial. In 1965 it was designated as an official historic site of the state of Indiana, and in 1966 it was designated as a National Historic Landmark of the United States. The preservation of the museum is monitored by the National Park Service. In 1990, the Department of Labor named Debs a member of its Labor Hall of Fame. While Debs did not leave a collection of papers to a university library, the pamphlet collection which he and his brother amassed is held by Indiana State University in Terre Haute. The scholar Bernard Brommel, author of a 1978 biography of Debs, has donated his biographical research materials to the Newberry Library in Chicago, where they are open to researchers. The original manuscript of Debs' book Walls and Bars, with handwritten amendments, presumably by Debs, is held in the Thomas J. Morgan Papers in the Special Collections department of the University of Chicago Library. The town of Debs, Minnesota is named after Debs. Former New York radio station WEVD (now ESPN radio) was named in his honor. Debs Place, a housing block in Co-op City in the Bronx, New York, was named in his honor. The Eugene V. Debs Cooperative House in Ann Arbor, Michigan was named after Debs. There are at least two beers named after Debs, namely Debs' Red Ale and Eugene. John Dos Passos included Debs as a historical figure in his U.S.A. Trilogy. Debs is featured among other figures in the 42nd Parallel (1930). His affiliation with the Industrial Workers of the World prompted actions by such fictional characters in the novel as Mac. Fifty Years Before Your Eyes (1950) is a documentary including historic footage of Debs, among others, directed by Robert Youngson. The narrator of Hocus Pocus by Kurt Vonnegut is named Eugene Debs Hartke in honor of Debs (p. 1). Debs appears in the Southern Victory Series novels The Great War: Breakthroughs and American Empire: Blood and Iron by Harry Turtledove. Self-proclaimed democratic socialist Bernie Sanders voices Debs in a 1979 documentary about his political career. The alternate history collection Back in the USSA by Kim Newman and Eugene Byrne is set in a world where Debs leads a communist revolution in the United States in 1917. A likeness of Eugene holding a beer keg above his head appears on a beer can from Revolution Brewing. Locomotive Firemen's Magazine (editor, 1880–1894). Vol. 4 (1880) | Vol. 5 (1881) | Vol. 6 (1882) | Vol. 7 (1883) | Vol. 8 (1884) | Vol. 9 (1885) | Vol. 10 (1886) | Vol. 11 (1887) | Vol. 12 (1888) | Vol. 13 (1889) | Vol. 14 (1890) | Vol. 15 (1891) | Vol. 16 (1892) | Vol. 17 (1893) | Vol. 18 (1894) . Debs: His Life, Writings, and Speeches: With a Department of Appreciations (1908). Girard, Kansas: Appeal to Reason. Labor and Freedom (1916). St. Louis: Phil Wagner. Audio version. "Susan B. Anthony: Pioneer of Freedom" (July 1917). Pearson's Magazine. 38: 1. pp. 5–7. Walls and Bars: Prisons and Prison Life In The "Land Of The Free" (1927). Chicago: Socialist Party of America. Selected Works of Eugene V. Debs: Volume 1, Building Solidarity on the Tracks, 1877-1892. Chicago: Haymarket Books, 2019. ^ a b c d Bill Roberts. "The Socialist Worker". Archived from the original on March 10, 2008. Retrieved July 19, 2007. ^ a b c d e f g h "Biographical: Eugene V. Debs," Railway Times [Chicago], vol. 2, no. 17 (Sept. 2, 1895), p. 2. ^ a b c d e "Eugene Victor Debs 1855–1926". Archived from the original on May 5, 2008. Retrieved 2008-07-22. ^ Shannon, David A. (1951). "Eugene V. Debs: Conservative Labor Editor". Indiana Magazine of History. 47 (4): 357–64. JSTOR 27787982. ^ Reitano, Joanne (2003). "Railroad Strike of 1888". In Schlup, Leonard C.; Ryan, James G. Historical Dictionary of the Gilded Age. Armonk, New York; London: M.E. Sharpe. p. 405. ISBN 9780765621061. ^ "American Railway Union Officers". Salt Lake Herald. 47 (273). April 18, 1893. p. 2 – via Newspapers.com. ^ Latham, Charles. "Eugene V. Debs Papers, 1881–1940" (PDF). Indiana Historical Society. Retrieved 2012-11-05. ^ "Embracing More Railroads; Pullman Boycott Extending, The Men Being Determined. Big Lines West of Chicago Crippled by the Action of the Strikers, Who Will Endeavor to Bring in All Labor Organizations – Estimated that 40,000 of the Workers Are Out – May Change Headquarters to St. Louis – The Managers Stand Firm". The New York Times. June 29, 1894. ^ "Editorial". The New York Times. July 9, 1894. p. 4. 'Organized labor' makes a miserable showing in its attempts to give aid and comfort to the Anarchists at Chicago....The truth is that every labor union man in the City of New-York knows that he becomes a criminal the moment he puts himself on the side of Debs or attempts to sustain Debs by quitting work to show sympathy for the strikes and the riots Debs has provoked. When he sent his dispatch to the railway laborers in Buffalo Debs became a misdemeanant under the Penal Code of this State....He is a lawbreaker at large, an enemy of the human race. There has been quite enough talk about warrants against him and about arresting him. It is time to cease mouthings and begin. Debs should be jailed, if there are jails in his neighborhood, and the disorder his bad teaching has engendered must be squelched. ^ Lindsey, Almont (1964). The Pullman strike: the story of a unique experiment and of a great labor. University of Chicago Press. p. 312. ISBN 9780226483832. ^ Chace, James (2004). 1912: Wilson, Roosevelt, Taft & Debs – the election that changed the country. New York: Simon & Schuster. pp. 80, 78. ISBN 9780743203944. ^ a b c Ray Ginger (1949). The Bending Cross: A Biography of Eugene Victor Debs. Rutgers University Press. ^ Farrell, John A. (2011). Clarence Darrow: Attorney for the Damned. Knopf Doubleday. ISBN 9780385534512. ^ a b c Eugene V. Debs, "How I Became a Socialist." The Comrade, April 1902. ^ "Eugene V. Debs. Obituary". Time. 8 (18). November 1926. p. 14. ^ a b "Social Democratic Herald". www.marxists.org. Retrieved 2019-03-03. ^ The Social Democracy of America Party History Marxist History. Retrieved July 29, 2008. ^ Greeley, Horace; Cleveland, John Fitch; Ottarson, F. J.; McPherson, Edward; Schem, Alexander Jacob; Rhoades, Henry Eckford (2 June 2018). "The Tribune Almanac and Political Register". Tribune Association. Retrieved 2 June 2018 – via Google Books. ^ "1900 Presidential General Election Results". Retrieved 2008-07-22. ^ 1904 Presidential General Election Results. Retrieved July 21, 2008. ^ 1908 Presidential General Election Results. Retrieved July 22, 2008. ^ a b 1912 Presidential General Election Results, U.S. Election Atlas, David Leip. Retrieved January 5, 2019. ^ Chace, James (2005). 1912: Wilson, Roosevelt, Taft and Debs – The Election that Changed the Country. Simon & Schuster. ISBN 0-7432-7355-9. ^ The Autobiography of Big Bill Haywood, 1929, by William D. Haywood, p. 181. ^ Eugene V. Debs Speech at the Founding of the IWW Documents for the Study of American History. Retrieved July 29, 2008. ^ Peter Carlson, Roughneck: The Life and Times of Big Bill Haywood. New York: W.W. Norton, 1983; p. 156. ^ Carlson, Roughneck, p. 157. ^ a b Carlson, Roughneck, p. 159. ^ Carlson, Roughneck, p. 183. ^ a b c Carlson, Roughneck, p. 199. ^ Carlson, Roughneck, p. 109. ^ a b William D. Haywood, The Autobiography of Big Bill Haywood. New York: International Publishers, 1929; p. 279. ^ Salvatore, Nick (1982). Eugene V. Debs:Citizen and Socialist. Illini Books. ^ Gillespie, J. David. "Doctrinal Parties 1: The Socialists and Communists." Challengers to Duopoly: Why Third Parties Matter in American Two-party Politics. Columbia, SC:U of South Carolina, 2012. p. 176. Print. ^ Jesus and Eugene Debs Archived 2011-01-27 at the Wayback Machine Jim McGuiggan. Retrieved July 21, 2008. ^ ""King" Debs". Harper's Weekly. July 14, 1894. Retrieved 2006-04-21. ^ Learn About Eugene Debs Texas Labor. Retrieved July 21, 2008. ^ "Eugene V. Debs and the Idea of Socialism". www.marxists.org. Retrieved 2 June 2018. ^ David Pietrusza, 1920: The Year of Six Presidents. New York: Carroll and Graf, 2007; pp. 267–69. ^ Pietrusza, 1920, pp. 269–270. ^ Statement to the Court Upon Being Convicted of Violating the Sedition Act Marxists. Retrieved July 21, 2008. ^ Kennedy, David (2006). The American Pageant. Boston, MA: Houghton Mifflin. p. 716. ^ "Election of 1920". Travel and History. Retrieved 2009-09-19. ^ "Election of 1912". Travel and History. Retrieved 2009-09-19. ^ a b "Eugene V. Debs Dies After Long Illness". New York Times. October 21, 1926. Retrieved 2008-05-17. ^ Nobel Foundation. "The Nomination Database for the Nobel Prize in Peace, 1901–1955". Archived from the original on September 29, 2007. Retrieved 2006-04-21. ^ "Debs Foundation". Archived from the original on 2011-05-09. Retrieved 2011-04-23. ^ "Eugene V. Debs hero". Thirdworldtraveler.com. Archived from the original on 2000-01-18. Retrieved 2010-03-08. ^ Greenberg, David (September 2015). "Can Bernie Keep Socialism Alive?". politico.com. Retrieved 5 May 2018. ^ a b Bates, Eric (16 October 2016). "Bernie Looks Ahead". newrepublic.com. Retrieved 5 May 2018. ^ Prokop, Andrew (30 April 2015). "Bernie Sanders vs. the billionaires". Vox. Retrieved 5 May 2018. ^ Fahrenthold, David (25 July 2015). "Bernie Sanders is in with the enemy, some old allies say". WashingtonPost.com. Retrieved 5 May 2018. ^ Hettle, Wallace (19 October 2015). "An historian compares Bernie Sanders and Eugene Debs — and explains why the pundits are wrong". The Raw Story. Retrieved 5 May 2018. ^ "U.S. Department of Labor – Labor Hall of Fame – Eugene V. Debs". United States Department of Labor. Archived from the original on June 6, 2011. Retrieved 2010-04-06. ^ Alison Hinderliter,"Inventory of the Bernard J. Brommel-Eugene V. Debs Papers, 1886–2003", Roger and Julie Baskes Department of Special Collections, Newberry Library, Chicago, Illinois, 2004. ^ Gerald Friedberg, "Sources for the Study of Socialism in America, 1901–1919," Labor History, vol. 6, no. 2 (Spring 1965), p. 161. ^ "Tiny town of Debs draws big crowd to Fourth of July celebration". The Bemidji Pioneer. July 5, 2011. ^ Max Mitchell (February 17, 2011). "Glenn Beck disses Co-op City". Bronx Times. ^ "Eugene V. Debs Cooperative House". Inter-Cooperative Council at the University of Michigan. Retrieved October 14, 2013. ^ "Debs' Red Ale". Bell's Beer. Archived from the original on August 24, 2013. Retrieved October 14, 2013. ^ "Revolution-Eugene". Ratebeer.com. Retrieved October 14, 2013. ^ Bernard Sanders; American People's Historical Society (1979). Debs (Videotape). Other side of American history. New York: Devlin Productions. OCLC 5014706. ^ "Bernie Sanders's Documentary on Eugene Debs". National Review Online. Retrieved 2016-04-11. ^ "Eugene Porter - Revolution Brewing". Revolution Brewing. 31 May 2018. Retrieved 2 June 2018. Bernard J. Brommel (Fall 1971). "Debs's Cooperative Commonwealth Plan for Workers". Labor History. 12: 4. pp. 560–569. Bernard J. Brommel (1978). Eugene V. Debs: Spokesman for Labor and Socialism. Chicago: Charles H. Kerr Publishing Co.
Dave Burns (2008). "The Soul of Socialism: Christianity, Civilization, and Citizenship in the Thought of Eugene Debs". Labor. 5: 2. pp. 83–116. Peter Carlson (1983). Roughneck, The Life and Times of Big Bill Haywood. New York: W. W. Norton. McAlister Coleman (1930). 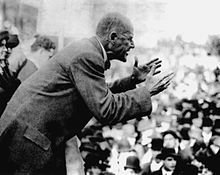 Eugene V. Debs: A Man Unafraid. New York: Greenberg. J. Robert Constantine, ed. (1995), Gentle Rebel: Letters of Eugene V. Debs. Urbana: University of Illinois Press. J. Robert Constantine, ed. (1990), Letters of Eugene V. Debs. In Three Volumes. Urbana: University of Illinois Press. J. Robert Constantine; Gail Malmgreen, eds. (1983). The Papers of Eugene V. Debs, 1834–1945: A Guide to the Microfilm Edition. Microfilming Corporation of America. Ray Ginger (1949). The Bending Cross: A Biography of Eugene Victor Debs. Rutgers University Press. Herbert M. Morais; William Cahn (1948). Eugene Debs: The Story of a Fighting American. New York: International Publishers. Ronald Radosh, ed. (1971). Great Lives Observed: Debs. Englewood Cliffs, New Jersey: Prentice-Hall. Alexander Trachtenberg, ed. (1955). The Heritage of Gene Debs (PDF). New York: International Publishers. Nick Salvatore (1984). Eugene V. Debs: Citizen and Socialist. Reprinted by University of Illinois Press. Irving Stone (1947). Adversary in the House. New York: Doubleday. Historical fiction. Eugene V. Debs Collection at Wabash Valley Visions and Voices Digital Memory Project. 6,000 PDFs of Debs-related correspondence. Eugene V. Debs Internet Archive at Marxists Internet Archive. It includes extensive collection of Debs' writings. The Debs Project: Eugene V. Dabs Selected Works. Informational website. 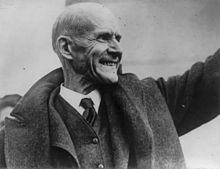 Eugene Debs and the Kingdom of Evil. Chris Hedges for Truthdig. July 16, 2017. This page is based on the Wikipedia article Eugene V. Debs; it is used under the Creative Commons Attribution-ShareAlike 3.0 Unported License (CC-BY-SA). You may redistribute it, verbatim or modified, providing that you comply with the terms of the CC-BY-SA.